The Your Computer artice starting with: big problem before the launch because the rubber keyboard mat not ready. Previously you told, on the launch wired prototype worked at hidden under desktop. At this situation why important the rubber keyboard mat? The dummy Enterprise connected as keyboard to prototype unit? Under the development which keyboards used for the prototypes? To be honest I can't remember if the dummy unit on display was connected to the wired prototype under the desk - I would have said it was, but it was along time ago! And that was the "pre-launch" that I remember, not the subsequent one which I know nothing about! I'm fairly sure we had working keyboards for development. (Debugging was done over a serial line to a terminal, so that used a separate keyboard.) 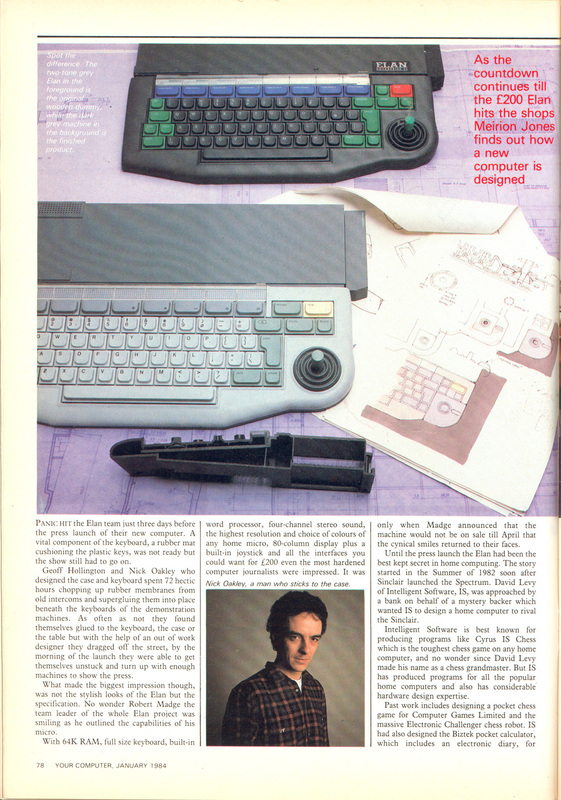 I vaguely remember issues with the rubber keyboard mat, but I don't remember it actually holding anything up - I think that was down to electronics and software! Another possibility: after the demonstration the press members can touch the dummy Enterprise? The rubber mat important because needed who is pressing keys feel the real feeling? Yes very probably, but I can't remember what the issues with the rubber mat were, ie. whether a quality issue or just a hold up in production. Compared to the Nick problems I think it was quite minor! Bruce! Do you know anything about Assembler program from Intelligent Software? It is mentoined here, and later in many articles. Also in a price list. Recently I have got a manual for this program, which I have scanned yesterday. Now I think the ZEN is same the advertisted Assembler/Disassembler program. Probably when the machine released, there was urgently need for one assembler program. IS does not have enogh capacity to write one from zero so they looked for an available one. Agreed with Avalon Software which released the ZEN for many machines. But it's currently unclear who did the Enterprise adaptation - the Avalon or IS? I guess the IS because the developer team have experience with Enterprise. No, I cannot recall IS having anything to do with an assembler! But it could be another Entersoft project that we, the developers at IS, knew little about. I am (or was!) very familiar with ZEN though because I "cut my teeth" on a Sharp MZ80K, using Avalon Zen, and used it for lots of projects! But it could be another Entersoft project that we, the developers at IS, knew little about. And I think this project not need to much time, modify the screen/keyboard/save/load routines in the original code are only few days, and some more for testing. It is a popular Assembler at these years on non CP/M Z80 systems? Yes I think it was all command-line based. I wrote a more interactive screen-based add-on for the MZ80K. zozo has just prompted something from my memory...one early machine I worked on while at school is the Research Machines 380Z, which was a common school computer in the UK in those days, based on a Z80. That had a small operating system which was called with a RST instruction followed by a function byte, and this is where the EXOS call method came from. I think there were other systems around that also used this method - the Nascom springs to mind but I might be wrong on that! Bruce! I think until the many years you are talked with many people (friends, coworkers, clients, etc) about "starting with computer" topic, who used which computers when begining. Before you find our forum ever found anyone who are used Enterprise? In Hungary when talking in about these are very frequent found man who are also started with Enterprise, or least sometimes used it because one of his relatives/friends has it. I would guess because it was only around for a short length of time, a long time ago! Commodore 64s, Spectrums, ZX80 and ZX81s, PETs, Apple IIs are another matter! In a Hungarian forum talking about what are the target area of the Enterprise when it is developed? For a gaming machine? For a business computer? School computer? Etc? Bruce, what is your opinion? 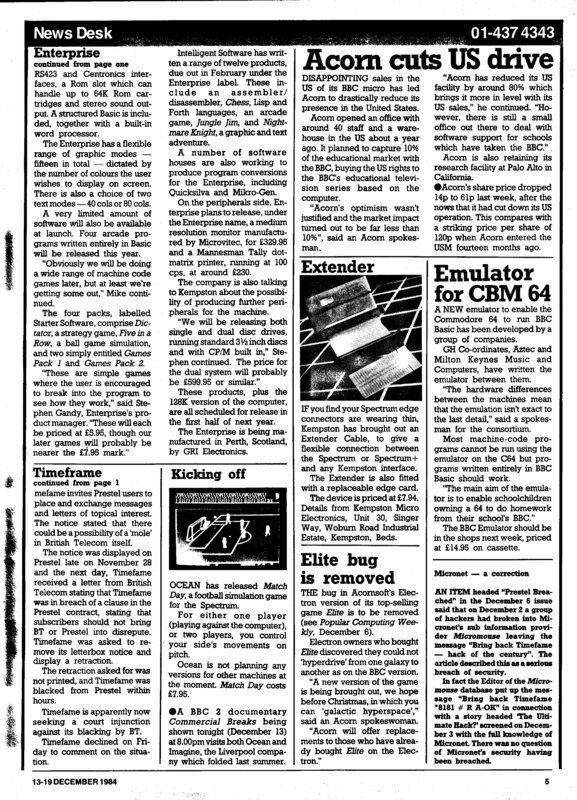 And can you remember the situation in UK computer market 82-83, when the development started? For example the C64 is when coming important part of the market? What is the dominant systems? The computer games are important, or these early years the computers generally are serious thing, the games only optional fun?